The 2017 Helitech trade show took place in London amidst a relatively optimistic climate. 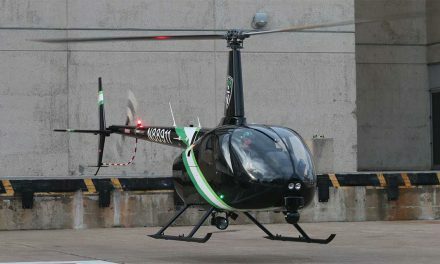 Is recovery finally in sight for the helicopter industry after several years of dismal performance? Since the collapse in the price of oil in 2014, the state of the oil sector has frankly not improved. However its downturn has stabilized which in recent times is seen as good news. Has demand bottomed out? Are oil companies continuing to downgrade their ambitions and investments in terms of exploration to a level so low that it is now difficult for them to slash costs at this level? Given how the world works, the need for oil remains such that platforms stay in service, which therefore boosts the need for helicopters. 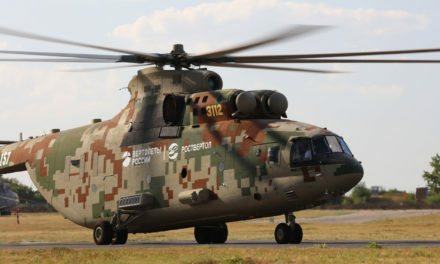 The confrontation emerges in the “super medium” sector supported by the withdrawal of the Super Puma family since the accident in April 2016 in Norway. The void left by the Super Puma reflects the current environment which ultimately favors aircraft with equivalent endurance but a slightly smaller payload and much lower implementation costs. 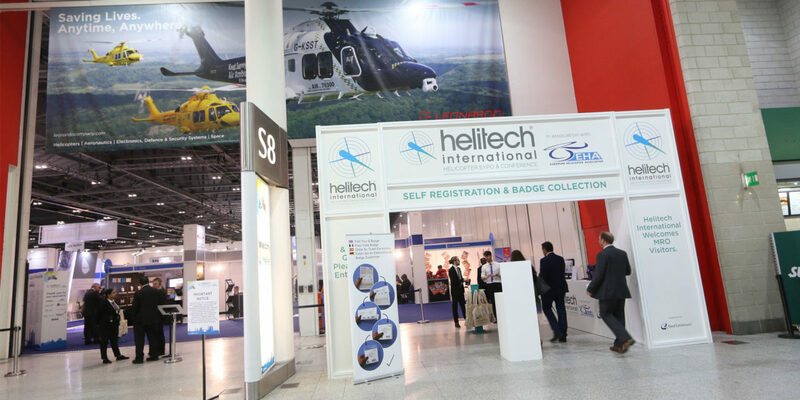 Helitech 2017 that just ended at London’s Excel center was intended as a “recovery trade show”. However, we will have to wait until Heli Expo in Las Vegas next year to be fully convinced and see what the sales figures reveal. 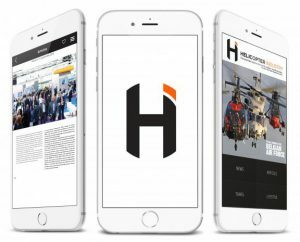 With its 200 exhibitors, a dozen static displays and relatively few announcements, Helitech does not have the critical mass to serve as an effective market indicator. Many exhibitors no longer see the interest in redundant commercial events, which prove too numerous and too costly. While helicopter manufacturers struggle to exist and shine, they are however not alone. In the world of Darwin, the organizers of trade shows also compete in the “struggle for life”…. Safran’s announcement was the major highlight of the trade show: Safran Helicopter Engines announced the launch of the Aneto, a new-generation engine in the 2500-3000 shp category. The French engine maker stated a 25% gain compared with existing engines on the power/mass or power/volume ratio, according to applications. The Aneto will first be mounted on the Leonardo AW189K which took its first flight equipped with the new engines in March 2017 and is expected to enter into service by the end of 2018. This major announcement is important for two reasons: first because Safran is expanding its high-power range with this emerging family that will be upgraded over the coming years. Secondly because it is a new and significant partnership between Safran Helicopter Engines and Leonardo. 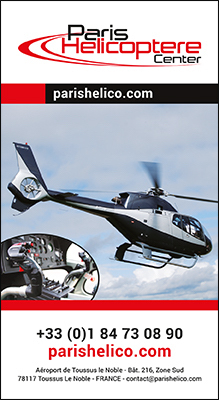 Helicopter Industry will cover the Aneto program in detail in its next edition in an interview with Florent Chauvancy, its program director. The Canadian equipment manufacturer presented at its stand its flotation kit integrating a liferaft that has just received EASA and FAA certification for the H145 T2. The raft is positioned outside the cabin which frees up space and accelerates its deployment thereby increasing the safety level. Eight systems have already been sold in Europe and deliveries have just begun. DART is also offering a retrofit of the AW139, moving the liferaft from the pod to the rear part of the float system. A modification that will reduce the size of the pods and therefore reduce the helicopter’s mass and drag. Also present at the DART stand, a safety net for the AW139 cargo hold offering easier and safer use. 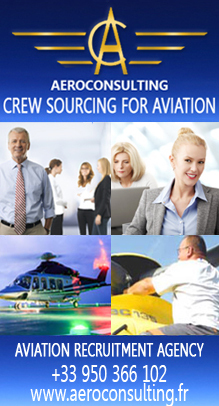 The equipment is EASA, FAA and Transport Canada certified. The equipment manufacturer also presented for the first time the series model of its exterior transport basket designed for the Robinson R66. Airtelis, RTE group subsidiary, was present at the show to increase its visibility with operators outside of France. The French company is specialized in mounting, assembly and maintenance as well as electrical network surveillance. It uses a fleet of Ecureuil B3, H135 and H225. It also provides services including leasing, maintenance and storage. 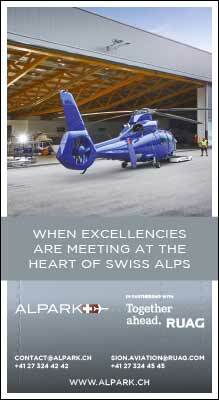 Based in Avignon, in the south of France, it currently stores around 20 Super Puma for the CHC company. The aircraft were conditioned and mothballed for a long-term hiatus. Airtelis’ documentary and technical expertise will also be applied when it comes time to prepare these aircraft for their return to service. The Ecureuil by Mont Blanc Hélicoptères, with its flamboyant decoration by Romain Hugault, was equipped with the Maximum Pilot View Kit (MPVK) for the trade show, developed by Swiss Rotor Solutions. It is a door fitted on the front right that is entirely transparent and curved to maximize the vertical visibility from the aircraft even when wearing a flight helmet. This door is completed with a floor modification with the addition of a glass section enhancing the downward vision. 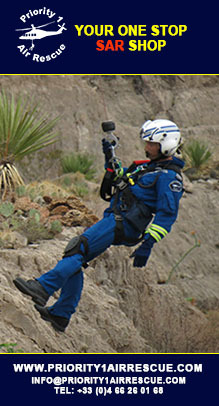 This equipment results in a ten-fold increase in the visible ground zone from the pilot’s position. The resulting safety increase was highly rated by insurance companies which announced a substantial reduction in the amount of premiums for aircraft fitted with this equipment. 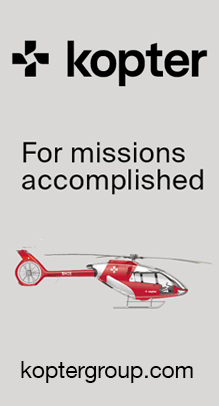 Eleven aircraft were fitted and 19 remain to be delivered, Swiss Rotor Solutions has announced the sale of 30 kits in Latvia, Sweden, Norway, Austria, Switzerland, France and Japan. The modification requires around 100 work hours and may be installed in any Part 145-approved workshop. Swiss Rotor Solutions announced that it was currently working on a modification of left doors at the request of the Los Angeles Police Department. The Italian helicopter manufacturer presented at its stand the first AW169 in EMS configuration received by Essex & Herts Air Ambulance service. It also announced the sale of two A169 to the Danish operator Uni Fly. 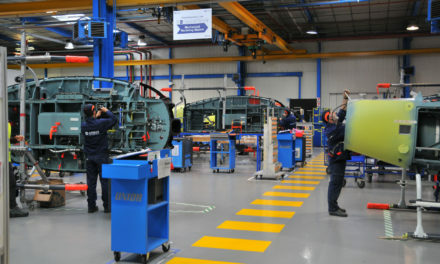 The aircraft will be used for maintenance missions for wind farms in the North Sea. It is the first sale of an AW169 in Denmark. Leonardo also revealed the sale of two AW139 to UK clients for corporate and VIP transport missions. However the major announcement, along with Safran Helicopter Engines, concerned the launch of the new version of the AW189 with Aneto engines. Named the AW189K, the aircraft is expected to receive its EASA certification by the end of 2018. Leonardo stated that the AW189K is an addition and not a replacement of the current AW189. The more powerful engines will allow for new applications. With “ITAR Free” French engines, there is also new opportunities on the global market that could arise if a military version comes to light in the coming years, which remains highly likely. Bell announced the sale of a Bell 429 to the Swiss operator Air Zermatt. The aircraft will be configured for EMS and SAR missions both day and night. Air Zermatt already operates a first aircraft of this type. The delivery of this aircraft next spring will coincide with celebrations of the company’s 50-year anniversary. Airbus Helicopters took advantage of the trade show to hand over to Midlands Air Ambulance its first H145. The aircraft that was displayed at the helicopter manufacturer’s stand will be added to the current fleet of three EC135. 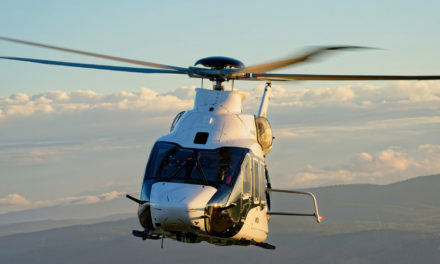 The aircraft, equipped with the Helionix avionics suite, will be personalized with EMS mission equipment and will be implemented by Babcock Mission Critical Services (MCS). The trade show was also the occasion to announce the sale of three H215 (one firm and two options) to the operator Airtelis. These aircraft will be added to its current fleet of two H225 and will be used for missions including aerial operations, lifting, tower installations, cable unwinding, mounting of electrical lines, maintenance, etc. The Franco-German helicopter manufacturer also announced the EASA certification of the automatic approach equipment for the H175 on Rig’Fly oil platforms. This system is already certified for the H225 family. Rockwell presented for the first time to its potential clients its Helisure cockpit display system (CDS) which features several multi-function screens. Initially developed for the Chinese AC312, the Helisure is now available as a retrofit for all light single-engine aircraft. To remain light-weight and a good deal, Rockwell Collins opted for a non-tactile solution while remaining innovative since each 6×8 inch screen integrates calculator systems. The screen offer several options: Primary Flight Display (PFD), digital map, as well as terrain synthetic vision with the HTAWS Helicopter Terrain Awareness System function with a representation of the surrounding terrain and ground proximity alerts. The leasing company expressed its trust in the H225 in London by displaying the aircraft implemented by the German operator Global Helicopter Service. GHS has leased the aircraft since early 2017 and is available for aerial operations and humanitarian support missions. It is the first public display of the aircraft at a trade show since the accident in Norway last April. 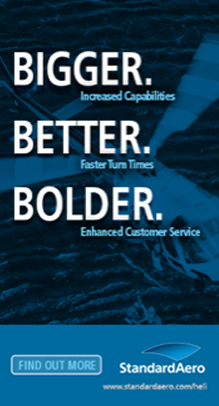 NextRecovery of the civil market: Airbus Helicopters runs some numbers and wants to believe!